Wouldn’t it be great if you could enjoy spending time at the comfort of your home and had someone get the goods you want delivered right to your doorsteps? Imagine instead of a convenience store run, you could spend that precious time doing something else you truly enjoy. Well, we weave your dream into reality. So no longer do you have to change from your pyjamas, nor leave your comfy bed. Neither do you have to spend on petro or put more miles on that priced car of yours. You can choose from any convenience stores for everything found in-store and whenever you need with GrabMart (Beta). Just made an order through the Grab app and let our GrabExpress team do the convenience store run for you. Try now and see what our users are raving about. What are the qualities (dimensions, price, etc.) of the item/s that I could ask to be bought? The dimension should not exceed the standard GrabExpress dimension of 30x40x30cm. What is GrabMart (Beta)? 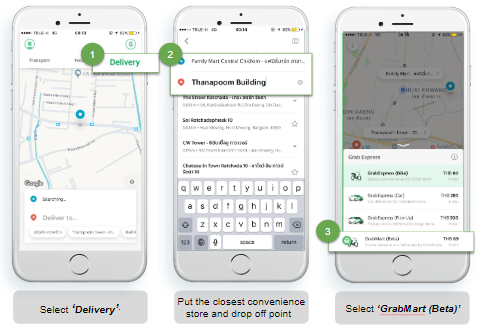 What is the difference between GrabMart (Beta) , GrabExpress, and GrabFood? GrabMart is a new service where customers can ask the grabexpress bikers to shop at a convenience store for them. What are included in the total amount to be paid by the customer? The price shown only covers the delivery fee for the rider’s time and effort. Where is GrabMart (Beta) available? No. Every GrabMart request will be processed immediately after a booking confirmation. You can change your order by contacting the rider directly. Changing pick-up and drop-off locations requires rebooking. The maximum total price should not exceed THB 500 and the dimension should not exceed the standard GrabExpress dimension of 30x40x30cm. What if the item I asked is not available in the pick-up point? You are highly encouraged to coordinate with your rider for possible substitutes or adjustments in your request. What if I cannot contact the GrabExpress rider? Or what if there are other problems with my transaction? What are the payment methods available? Can I pay via Grabpay? 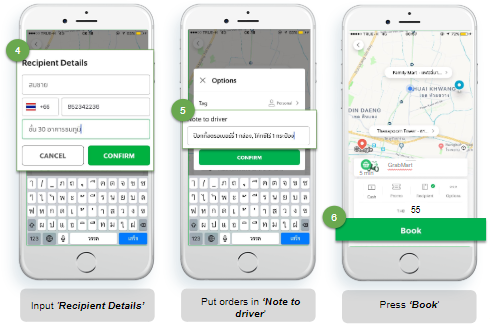 Can I book a GrabMart (Beta) service but it will be delivered to someone else? Can I ask the rider to buy different items from different stores? No. All items should come from one store only. What if the rider bought the wrong item, size, or quantity or damaged/expired items? The rider will be liable for it but if it is the customer’s fault, the customer will be liable for it. What if I am not at home to receive the items? You can contact the rider and inform them the name and contact details of the receiver. It depends on the rider, the distance, and other external factors. Always keep in contact with the rider! Is this available 24/7? At what hours can I book? Yes, you can book anytime as long as the store is open. Most reliable coverage hours is from 9AM to 10PM. 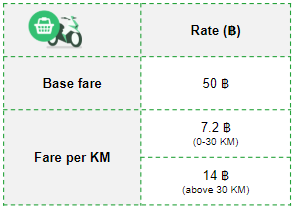 Surcharges apply between 9pm-midnight (THB 50), and midnight-6am (THB 100). You can see the real-time location of the rider through the app. How do I contact my rider? The contact number of your rider is available in the app. You may reach your rider through SMS, call, or GrabChat. The rider is asking me to pay for the parking. Should I pay for it? We are kindly asking the customers to ease the burden of the riders by shouldering the parking fee.